Check it out you wingnutty wingnuts. President Obama is all about the national security thingies. Sure, you didn’t buy it when he skipped an intel briefing to yuk it up with volunteers in Vegas. Or when he staged a photo op flanked by the caskets of four Americans killed at the U.S. embassy in Benghazi. Or when his Twitter account hawked campaign sweatshirts as the men murdered on his watch arrived at Andrews Air Force Base. Or when his administration blamed a crummy movie for the continuing spread of unjustifiable Islamist violence on Jihad Friday. But he totally took a phone call about security stuff while campaigning in Colorado. And there’s photographic evidence! The president sat down for his photo op, but some Twitter users still see an empty chair. @whitehouse What is this? 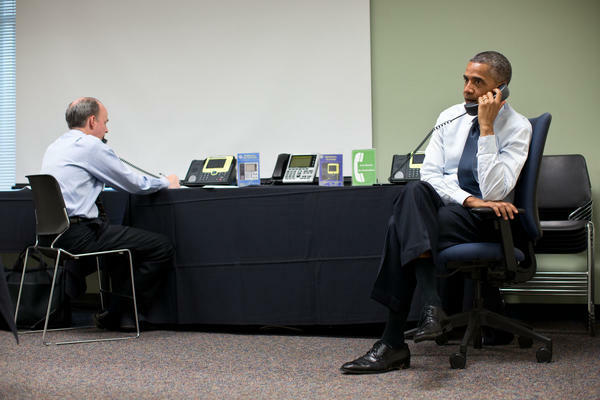 Photo op showing him on the phone discussing national security issues? Like he cares. We've had enough of this. That look of laser-like focus in Obama’s eyes can only mean one thing: Beyoncé took his call! Let’s hope she has some words of wisdom on national security and foreign policy. Maybe he’ll listen to a 3 a.m. phone call from her.